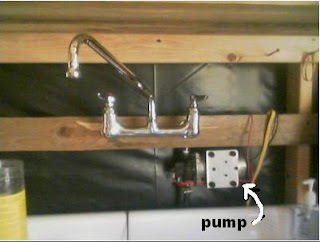 Here are some pictures of the water system, it is all inside our cabin so we don’t have to worry about anything freezing. It basically works like this, we have a 55 gallon plastic (food safe) barrel next to the sink, it is filled with clean water. We placed a length of black plastic tubing (it’s like a hard water hose) going down into the inside of the barrel, it goes all the way to the bottom of the barrel. 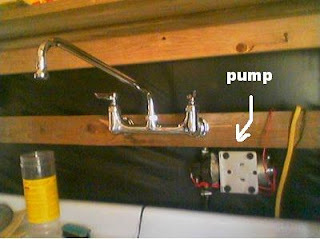 This goes to a 12 volt water pump, this is attached directly to the water faucet which is attached to the wall above my sink. The pump is powered by one of the big batteries in our power system. It is always powered on, but only comes on when the faucet is opened. When the faucet is opened, the pump immediately pumps water from the barrel to the faucet, it creates pressure so the water comes out hard enough to do what I need it to do. Right now, there is only cold water, we have to rely on our wood stove to provide hot water for now, that will change in the future, but for now, it works great! 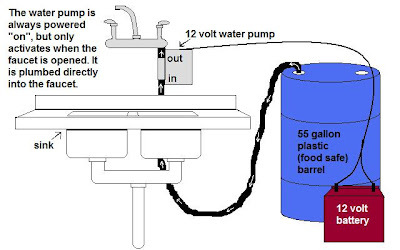 The graphic I drew is pretty close to how it really looks, but things are a bit farther apart then I drew, the barrel is pretty close to the sink, the pump is really that close to the faucet, the sink is not that far from the faucet, and the battery is not that close to everything else. I love my sink, it was a “found treasure”, when we still lived in Irving, I was coming home from work, taking one of my usual short cuts, I passed a rent house that was being renovated. There was a pile of trash and stuff sitting out near the street. I saw the sink sitting there and decided that it would be mine. I went home, got Bob, we went back and got the sink and a few miscellaneous items, it’s amazing what people throw away! :) The sink has been around for a while, I would guess it’s a 40s or 50s model, you don’t see them like this anymore. It’s enameled steel, white, with a double bowl design, what is different is it has built in drain boards on both sides of the sink, (all made out of enameled steel), it has an art deco look to it. The enamel is in pretty good shape, it does have a few dings in it, but far fewer than my original sink at my old house! The biggest advantage for me is the drain boards, most people now days have automatic dish washers and don’t have much need for these, but since I am living more like a pioneer, the drain boards are a real help to me. Bob plumbed the drains to drain outside into a pit, a gray water system, so now I am all fixed up with pressurized running water. The pump does make noise when it comes on, not too loud, about like a quiet garbage disposal, you definitely know it’s running, but I don’t mind a bit, though we will have to be aware of the noise factor when one of us is asleep, it would probably wake the sleeping person, since our bedroom is just a few feet off the kitchen and there are no walls inside, any noise made inside the cabin is immediately heard all over the cabin. Today, I had planned on doing other things, but I ended up helping Bob most of the day, we poured concrete to make walls, Bob poured, I tamped and smoothed, the other thing we did was dig a hole, it’s a big hole, right now it’s about 3-4 feet deep and about 6 feet across, the digging is not too bad, the soil here is great, very little clay, but there are a lot of rocks, big rocks, if it weren’t for the rocks, we would have a really big hole! The hole is going to be a cistern to hold water when it rains this summer. I’ll explain a bit more about that later.